The zombie thriller 28 Days Later ruined my life forever. Before seeing it, my top horror movies included the likes of the Ring and the Exorcist. These normal horror movies invoked excitement and fear in me. But a zombie movie in the tradition of 28 Days Later leaves me rattled for weeks. I started suffering from a mild case of zombie obsession, and I have really spent some time with it. Trying as best as I can to understand what exactly it is about them that scare me so much. And I have finally reached a few conclusions. 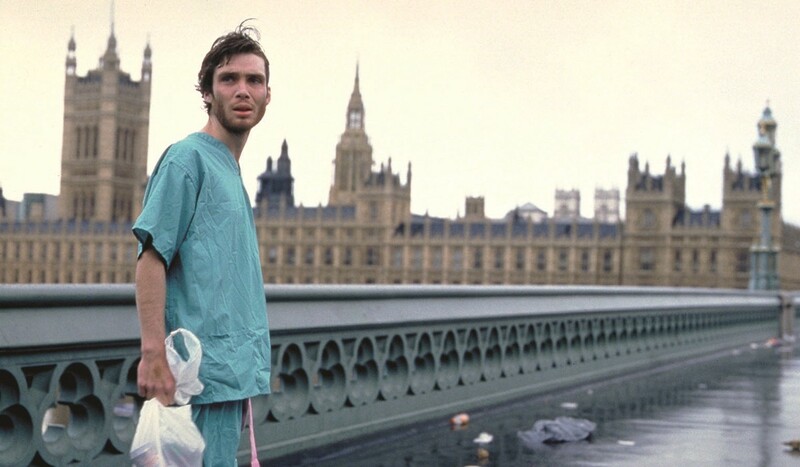 Still from the iconic opening scene of 28 Days Later. You will find lots of articles mentioning the aesthetic hypothesis of the uncanny valley as the prime reason for zombie scariness — and I do think there’s a lot to it. In summary, the uncanny valley states that feelings towards human-like entities that are not human (e.g humanoids), will change from affinity, when they are obviously not human, to revulsion when they are very similar to humans. When all that remains between “us” and “them” are little details, our sensitivity towards those details balloons. The closer to perfect a humanoid’s imperfections are, the less we like it. Particularly when it comes to minute facial movements. Professor Hiroshi Ishiguro’s “humanoid twin” nails the uncanny valley. Our sensitivity towards unnatural body language is a deciding factor for whether we find a humanoid revolting. This goes a long way to explain our feelings toward surgically enhanced lips. It isn’t only that people with artificially bulky lips look weird. But rather that the procedure of manipulating lips significantly detracts from the subject’s ability to communicate using fine tuned facial expressions. It becomes hard for us to read and understand people with manipulated lips and thus we become less inclined to like them. The uncanny valley has been empirically proven to some extent; a robot or an animated character that is human like, but still discernibly “unhuman” will provoke a negative reaction. Only 100,000 years ago we shared this earth with no less than five or six other human species. What was it like to meet Neanderthalensis, Erectus or Denisovans? We can only imagine. In many ways we were incredibly similar to each other. But were we similar enough to provoke unreasonable fear? Did their similarities to us actually provoke an uncanny valley response? We cannot know. Some of those encounters may actually have been sexual in in nature. We share some small percentage of genetic material, though as far as I can understand, the jury is still deciding as to whether that can be explained by interbreeding or by common ancestry. Forensic and artistic reconstructions of Homo Neanderthalensis. They seem like nice enough folks. What if they moved? Would we understand their facial expressions? The circumstantial evidence indicates disastrous outcomes on the part of our human siblings. They died off rather suddenly upon meeting us. There are two main theories for this extinction. We out-competed them in the game of foraging. Using our superior language and social abilities we were able to co-operate in larger and more strategically advanced groups. Simply put: we got to the berries before they did. Our social skills and language abilities arguably made us better fighters as well. We were able to socially sustain larger groups, and communicate more efficiently within those groups. Our weapons were perhaps more advanced. Simply put: we were better at organising killing. The real explanation is likely a mixture of both. We just don’t know in what combination. What we can know, is that the uncanny valley isn’t a new phenomenon — our genetic material is the same as that of 70,000 years ago. It is likely that we had the exact same primal reactions then as now. But there is no need to invoke violent causes for their demise; climate change and competition could very well be enough to explain the bulk of the extinction. But I cannot help but wonder whether we found them revolting as we do with humanoid robots? Or whether we felt affinity towards them, as we do with other primates? Seeing 28 Days Later is as close as I ever hope to get to experiencing post traumatic stress disorder. The novelty wasn’t only that the zombies were fast and inhumanly strong in themselves. Their biggest advantage was arguably their zerging abilities; filling every gap, piling on top of each other to climb every wall, blocking every path, flowing like a tidal wave to encircle and trap their panicking prey. Oblivious to any danger, almost as if moved by a higher calling or a hive mind. Zombies are completely separate and take no notice of each other. Their behaviour is completely predicable. Any given stimuli will excite the exact same response in any given zombie regardless of circumstances. These corresponding reactions result in a weird form of cooperation. No member of a zombie collective is even aware of being part of a stampeding herd. Their behaviour is predicated exclusively by the urge to satisfy their immediate needs. Humans are free-for-all as far as zombies are concerned. This results in the almost immediate extinction of all humans in their vicinity. At this point they become classic victims of the tragedy of the commons. Soon enough they are relegated to lumbering around in urban vistas and on overgrown railroad tracks in search of the very resource they have themselves utterly depleted. Brains. After 28 Days Later I started having recurring nightmares that always ended in the same anticipatory horror scene. Another survivor and myself embracing each other in the corner of a room, despondently awaiting the inevitable end. The door seconds away from shattering to the frenzied tackles on the other side. In the dream, this moment seemed to stretch out for hours. Leading up to this moment; all my loved ones had either fallen or become zombies themselves. I’d had to kill my own children out of mercy. My friends, now zombies, had turned turned against me. The betrayal is what gets me the most. There is a scene in 28 Days Later where the protagonists travel through a site of carnage, and one of the members, a father, looks up at the corpse of a zombie. A single drop of that zombie’s blood falls directly into his eye — and almost instantly he is transformed. If I remember correctly, a group of soldiers arrive and shoot him in the nick of time. His daughter sees this transformation from beloved father to ravaging beast. I realise he doesn’t control his behaviour once infected, still — the betrayal shatters me. My nightmare always ends with the door crashing down. A biological mass of zombies envelopes us. I kick and I scream and wake up in sweat and a sense of primal recognition that this very thing has happened in reality. Not with real zombies of course, but among sentient humans. Is my recurring nightmare in fact only a bleak reproduction of what countless Jews felt like when trying to flee and hide from the beast of Nazi racial hygiene? Was this what Tutsi and Hutu moderates felt when they huddled together in school buildings in the futile hope of escaping the machete onslaught? What about the Khmer Rouge outbreak in Cambodia? The examples are too numerous to count. And herein lies the true source of my zombie dread. A zombie movie in the tradition of 28 Days Later is an allegory for how humanity behaves at its worst. When it is completely unconscious and collectivistic. When it is moved by fear and primal hatred. When it finds itself in the uncanny valley — facing another group of humans that they do not perceive to be human. Top left: A fateful drop of blood. (28 Days Later). Top right: Brutal awakening (28 Days Later). 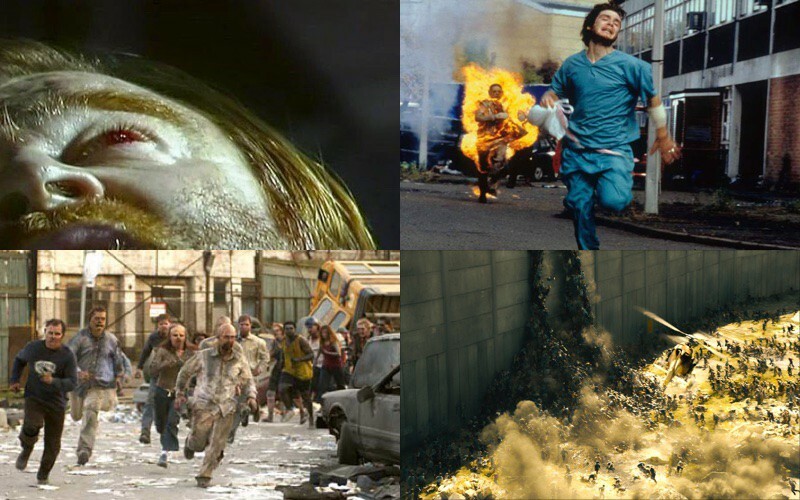 Bottom left: Zombie Olympics in Dawn of the Dead. 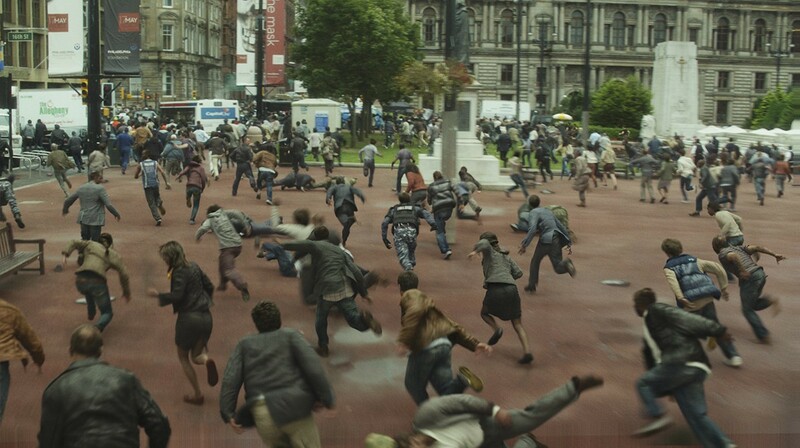 Bottom right: Zombie ladders in World War Z. Most people probably find this explanation somewhat pretentious, or at least unfit for casual movie conversations. But I cannot unthink it. Nowadays we do not encounter human-like entities such as Neanderthals or Denisovans that can be said to provoke a primal uncanny valley response in us. Instead we encounter other Homo sapiens, albeit with mildly differing traits and customs. Unfortunately it appears that we are good at collectively imagining even other humans as un-human. Why? When the reptile brain of collectivistic reaction is in charge, there is absolutely no reasoning that can be put forth to stem the tide. Genocide on the scale of the French Revolution, Armenia, Rwanda, China, Cambodia, Soviet, and the Third Reich are ultimate expressions of this phenomenon. Each of these genocides required the same basic recipe. An effective compartmentalisation of another group of people with certain external traits as something other than human, sub human or evil. Within that other group, there are no redeeming qualities to be found; only danger, immorality and pollution. The characterisation and myth-forming of the own group as human, natural and pure and above all as threatened and slighted. These two ingredients mixed together with some combination of economic scarcity and propaganda seem to be able to cause a mass scale uncanny valley fear response. The “otherness” that we perceive while under the influence of collectivism is real only so far as our minds make it real. Above all it is an artefact in the collective inter-subjective myth. The perception of a humanoid robot can be said to be objectively “other.” The perception of another Homo sapiens however, cannot be “other” except in a purely subjective sense. For the most part we are not actively killing each other across the lines that divide supposed collectives. But that same zombie energy that from time to time moves masses of people to commit grand scale murder exists all the time, at some level in society. It is a question of degree, not kind. I see this zombie energy primarily in the setting up of lines of division between humans who do not share external characteristics such as wealth, skin color, views, gender, religon or nationality. These supposedly “separate” collectives seek to enforce their will upon one another, mostly with government or some other “authority” acting as a proxy. It is only natural that government will be found acting as nexus and amplifier of these tendencies. Either group will strive to control and reign in the other group, naturally this struggle will be played out in the arena of “legitimate” politics and legislature, as well as in other arenas. The worst atrocities the world has seen have been perpetrated by the cold and impersonal beast of collectivism. This beast has the power to manoeuvre the hands of individuals to commit the most unspeakable crimes, while at the same time absolving those same individuals from any personal responsibility. Once it is a matter of primitive existential fear á la uncanny valley, the unleashed powers cannot, under any circumstance, be reasoned with. It is too late. In the framework of strong collectivism, an individual does not exist, has no rights of its own — but is defined entirely by its membership in a specific group. Full blown collectivist thinking removes personal responsibility and identity from an afflicted person — in the same way that a drop of zombie blood in the eye of a caring father suddenly removes any personal responsibility and any identity from him. He becomes entirely predictable, a certain reaction to a given stimuli is guaranteed. Real life zombie movements are much more prone to ritual and grandiose collective symbolism than the movie zombies. A real zombie movement will peg a Fasci to its chest, or decorate its halls with swastikas or hammers and sickles. Sometimes it will carry a cross or a crescent as a rallying religious symbol. It may even purport to represent an enlightened democratic and humanistic tradition. Whatever excuse it might have, it is recognised most clearly by the unconscious flag waving zombies that surround it. Another side effect of the hunger for grandioseness is the hero worship in which certain individuals are brought forward as prime examples of the correct human characteristics. In the minds of the herd, they can almost feel themselves becoming these heroes. Or at least being part of enacting these heroes’ stories. These myths, once established, are nearly impossible to dislodge, and the zombies will line up to find out how they can best be a part of the collective story telling. Collectivism is the loss of our essential humanity, the abandonment of our souls to authority and collective myth. Zombies are humans without essential humanity. What is a North Korean soldier, shooting an attempted escapee, but a zombie? The country he is “serving” is the world’s largest open air prison. But the prison is mainly a figment of a shared imagination. If the people within those borders would stop believing in the collective myths that pervade, the prison system would dissolve into thin air. Easier said than done. Myths have severe repercussions in reality so far as they are manifested through human action. But they are nonetheless imagined. What is a Ukrainian militiaman, gathering jewish communities for execution? What is a group of hutu militiamen, going village to village, slaughtering people with machetes? What is a pilot, dropping a bomb that eradicates an entire Japanese city? What is a drone pilot? What is a mother, urging her son to go fight for king and country? What is a policeman who steals cash from a citizen, citing eminent domain? What is a judge who sells juvenile delinquents to the prison industrial complex? What is a private individual who lets this or that charismatic demagogue convince him of the myth that he has a “right” to the fruits of a rich man’s labour, or that an insurmountable wall shall be built to keep out polluting immigrants? As I stated earlier, zombie movies are allegories pointing towards how humans really do behave against each other under certain circumstances. I see those behaviours played out in observable reality, the zombie energy exists even when it is not fully matured into murderous rampage. In the movies, zombies appear due to infection of a pathogen that takes control of their bodies. In reality; humans become zombies when they are contaminated by a specific collective myth. The myth of legitimate coercive authority, in which the collective serves only to enact the will of purely imagined authority. For good and for bad, ideas are powerful. The most successful ideas are the ideas that will shape the behaviour of humankind. There is no way to escape this fact. I don’t think that the answer to our collectivistic tendencies is to be found in abandoning social life and to shun other people. Rather, I think the solution lies in trying to saturate fellow human beings with anti-collectivistic ideas. I want to be part of civil society. I want to live with people. I would like them to believe what I believe. But I cannot use force to fight force. I cannot use collectivism to fight collectivism. I can only use myths and ideas to fight other myths and ideas. So I choose to advocate the idea of individual sovereignty; the idea that no man may legitimately force the hand of another man; the idea that no man may initiate violence upon another man, not even via the ballot box. Ultimately this idea is also a myth. A figment of the imagination. It will only have power so far as people choose to substantiate it with action. I like your comparison. Do you carry the comparison carry over to the moral/ethical ream. I mean zombies are not moral agents, but these “zombies by belief” still are moral agents right? Why yes. Humans with normal mental faculties are always moral agents. Collectivist coercion must be exposed wherever it is encountered. Since it will always, in the long run, result in a apologetic framework wherein morality in itself is corrupted into something that is abhorrent and deadly. As collectivism rises, morality becomes increasingly irrelevant to the human psyche, it comes down to primal survival and dealing with immediate existential threats (real or imagined). “… it comes down to primal survival and dealing with immediate existential threats”. Don’t forget the immediate existential benefits— real or imagined. This type of collectivism is similar to the bubble/burst mentality. ~ former buyers to sell before prices drop further to recover costs. Looking from the outside, the chaos of individual choices leads to herd behavior. Usually a benevolent invisible hand appears to be working. But sometimes, uncontrollably and unintentionally, a malevolent invisible fist will punch through a market striking fear in buyers and sellers. Also, bonus points from me for the verb “zerging” (I had to look it up). You’ve gotta read this, guys. It has zombies AND Neanderthals AND a movie review AND a near-poetic cry for freedom. We have an example every night in the news. Whatever utterance Trump decides to say on whatever topic, the people he is addressing invariably start to chant USA, USA… It is positively scary. It happens with any politicians, but with Trump in particular it seems that the real reason people go to the meetings is just to find other people like them. Yes. This is a very clear example of collectivist zombie energy. Good metaphor. Though, like Neusse, I still ponder the relationship between rationality and morality. Thanks. Now I have another reason to be skeptical of my neighbor’s smiling face. Is he smiling because he sees a social benefit from me or is he imagining this meeting as an opportunity of tearing flesh from my neck? I can’t tell for sure. But I gain more from assuming the former than the later. Just as I’ll continue to assume that the driver approaching from my left will rationally heed the traffic light ahead for the collective benefit of us all, rather than irrationally risk his life and mine by rushing through toward his destination.